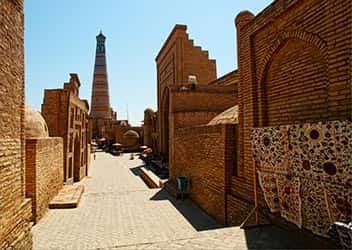 Khiva is a city frozen in time, that’s the first thought that came to my mind when I saw the narrow dusty streets, clenched in the arms of ancient buildings. Also here once stretched caravans with bales which were filled with silk, spices and other precious things. The city was noisy and seething life, but now it is a quiet town. My Journey to Khiva started quite ordinary. I flew to Tashkent by Uzbekistan Airways. But then everything was a bit more complicated. 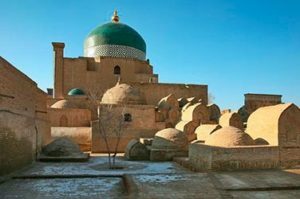 Khiva is a green oasis, which is located in the heat of two deserts. To get to it or rather the nearest regional center of Urgench, you can go by train or by bus from the capital. The second option is clearly not liked me, when I saw the full puffing old hearse, clearly devoid of even the air conditioner. The train was sweeter because in Uzbekistan prices for this type of transport is not too high. A total of 20 hours in the car and I will be in a taxi, and from Khiva separates me just one hour. 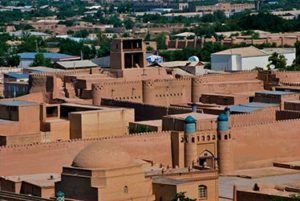 Khiva is a truly amazing city, which since time immemorial has been divided into two parts. Inside, the habitat of the nobility, called Ichan-Kala and is separated from the rest of the city by a high stone wall with four gates. There is one input to each side of the world. The eastern part is the main portal for tourists. There they sell tickets and the price includes admission to all museums in the city. If you come to Ichan-Kala just to eat, you can select another input, and pay nothing. 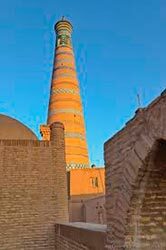 The most famous sight in Khiva is the unfinished minaret Kalta Minar, amazingly bright, covered with juicy patterns, like something on a vase. Nearby you can see the building of the harem. It is located on the territory of the ancient fortress Kunya Arch. However, the abode of the eastern virgins are not the most famous building here, in contrast to the palace of Muhammad Rahim Khan, whose inner rooms are decorated with carvings. 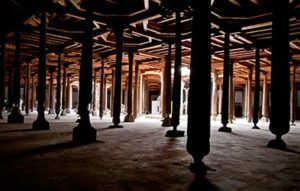 Other my favorite building is a real forest of columns, the Juma mosque. More than two hundred pillars support the roof here. And then there is the mausoleum Pakhlavan-Mahmoud, who is worshiped here as the patron of the city and there is the minaret of Islam-Hodge, as much in height of 45 meters. 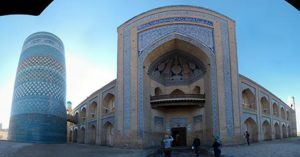 The tour from tour operators in Uzbekistan includes all the sights of Khiva, and here I decided to explore the city itself. All sorts of beautiful places are located in the outer city, Dishan-Kala. But I like to wander through the mysterious maze of streets internal settlement, something similar to the Moroccan medina. Even a simple walk in search of suitable souvenirs and gifts here turns into a fascinating journey. In one of those journeys through the narrow lanes where sometimes two walkers barely miss each, I bought a gorgeous fur hat. They were invented by the way the sage, poet and concurrently saint – Pakhlavan-Mahmoud. 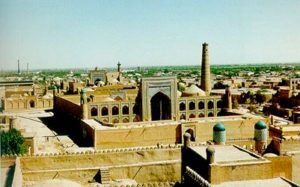 In Khiva I was lucky to stay with a friend, so that all Asian hospitality, generously poured out on me. 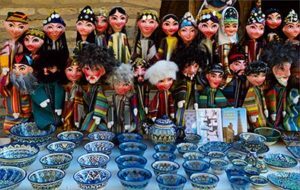 If you want to go through such an extraordinary experience, do not book a hotel in Uzbekistan, and try to stay at any of the local residents. My generous hosts not only to show native city, but also drove me into a unique restaurant “Farruca”. Instead of the usual room you eat in a real yurt. They told me the secret of how to cook barbecue on embers pair. You just have to take the the branches of saxaul, who grew up in the desert, and under the influence of drought, and the sun turned almost to stone. I’m leaving a mysterious and almost native of Khiva. But I dream to go back.